The length of the legs in the next step is dictated by how long of an arrow you are going to store in your rack. 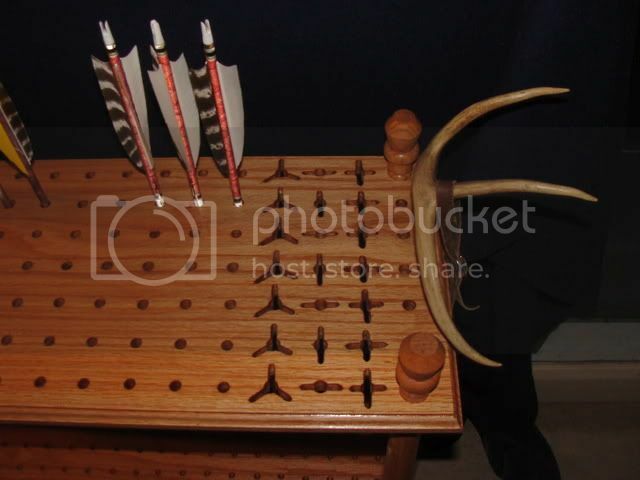 It is best to set an arrow on the bottom board and measure the distance that you will need between the boards to give the feathers adequate clearance above the top board. Using the 25" legs I cut the bottom portion (which will become the top portion) at the grooved ring farthest from the end. This resulted in a 22"long leg which provided adequate clearance for 5" feathers of my 29" long arrows. Again adjust this height as needed. 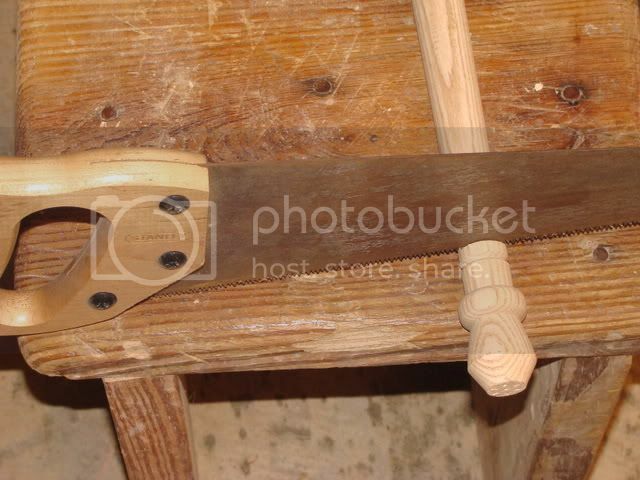 Each portion of the cut leg was then sanded to insure it was flat. At this point I chose to stain the project. 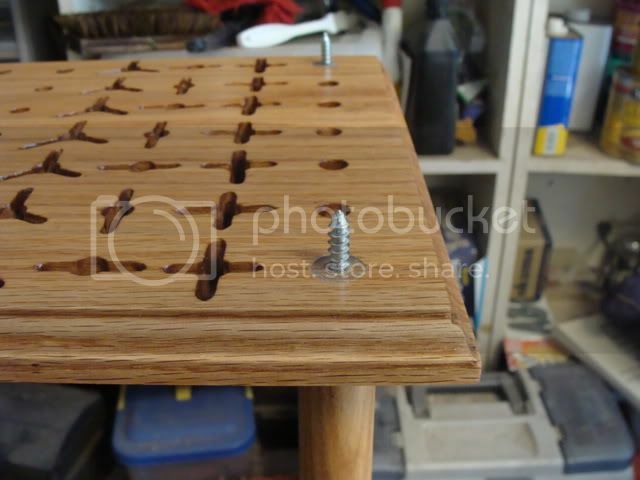 My reasoning was that A)It would be easier working with the individual pieces rather than the entire finished project and B) To prevent stain from the top board dripping through the shaft holes onto the bottom board. The longer legs are now screwed into the top of the bottom board. No glue is necessary, but if you choose to do so, I do not recommend gluing these legs until you are ready to follow up with the next several steps ending with the placement of the top board and end caps. Otherwise, with the glue set, the top may not align with the post and the glue joint will have to be broken to force it into alignment. Next the holes in the corners of the top board which you drilled out with a 15/64" bit are widened using a 1/4" bit. 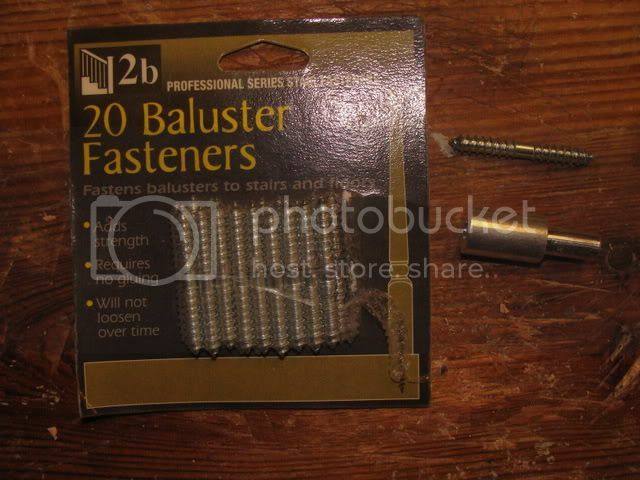 This is to allow for the easy passage of the baluster fastener. 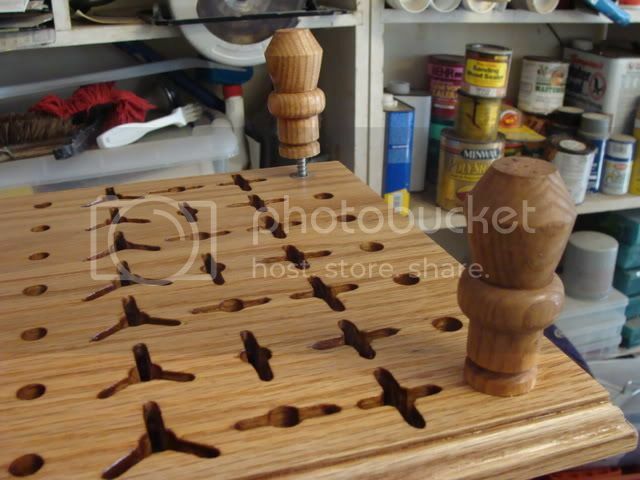 Drill a centered hole into each of the cut off sections of the 4 legs and the cut off tops with a 3/16" drill bit. You only need to drill about 1" deep. Although this is not a picture of the kit, you can purchase a kit with 4 fasteners and the driver together. 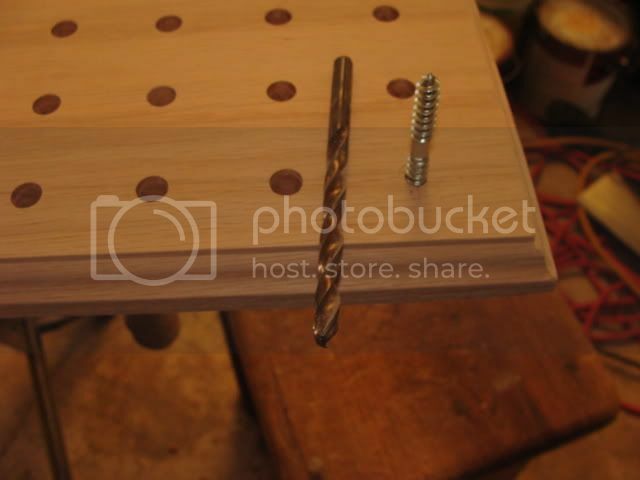 Align the corner holes of the top board over the drilled holes in the legs and drive the baluster fasteners in all corners. 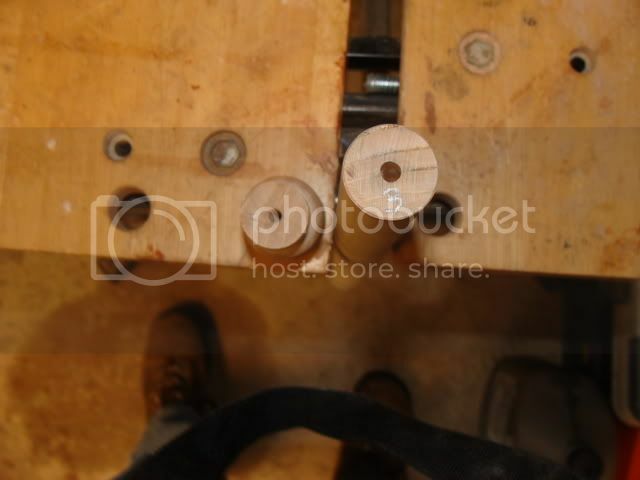 Align and tighten top post (cut off sections of leg) onto the baluster fasteners. 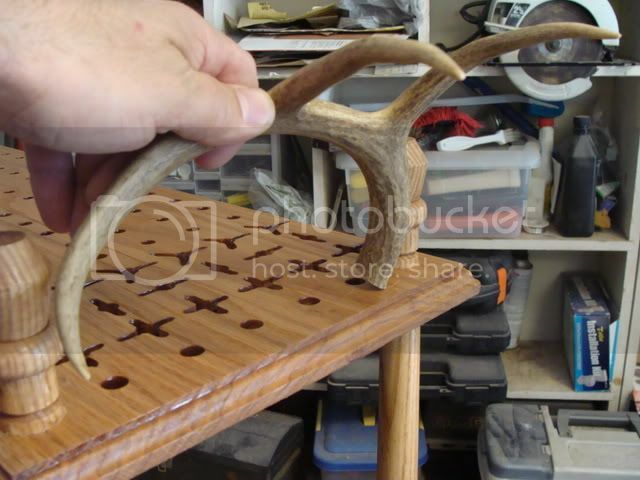 If you are not proceeding with the antler option, finish your project with some rub on polyurethane. I will post Antler Option tomorrow. Thanks for the kind words. 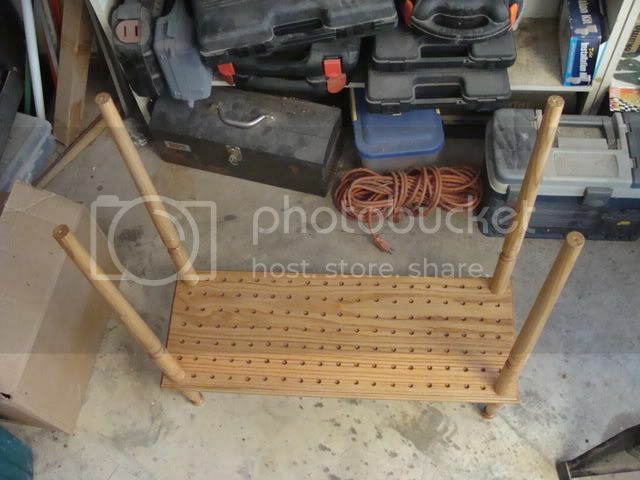 If at all possible try to utilize a rack that is fairly uniform so that the sides match. First with the antlers cut off, position it on the top board with the base towards the rear and tines pointing out away from the project. 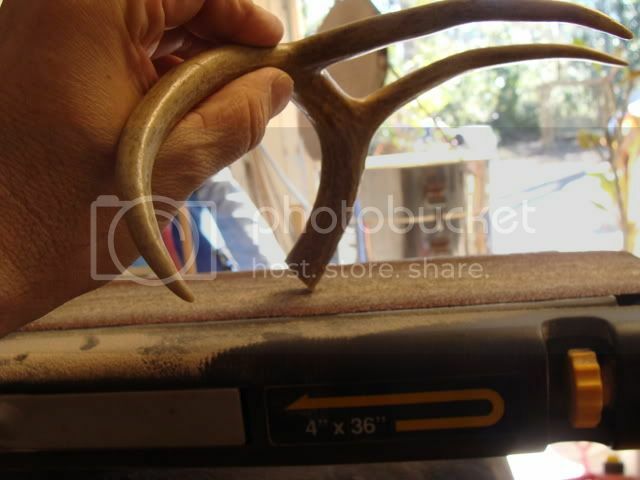 Adjust the tilt of the antler to the desired angle and mentally note that appearance. 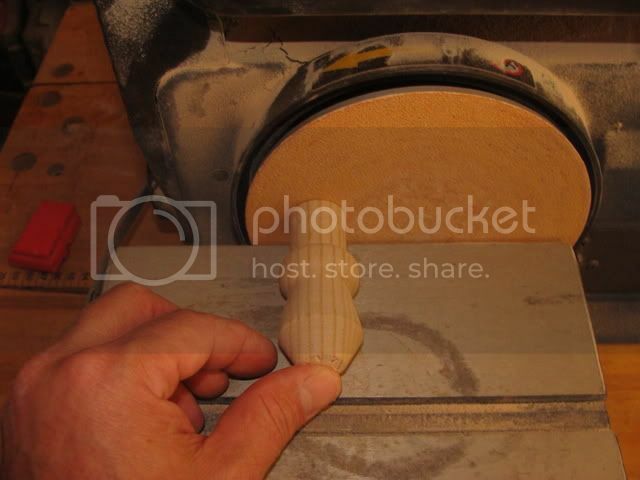 Using the belt sander, sand the base to the angle desired. Sand, recheck angle on project, sand, recheck, until you have the angle desired. Once angle is achieved, lightly draw the outline of the horn base onto the top board. 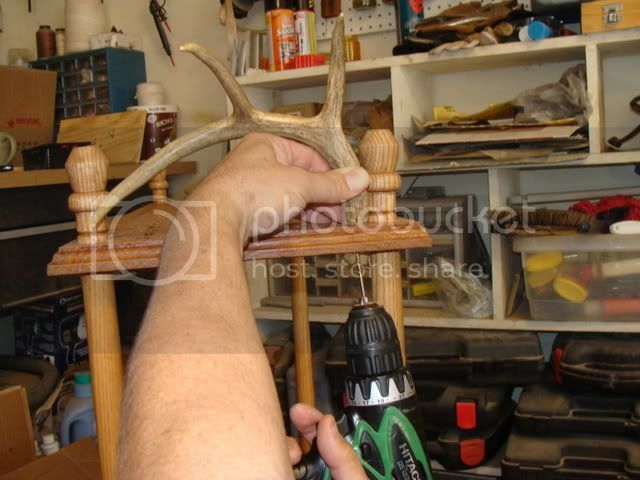 Mark center of this outline and drill.Initially use a bit the same size that you will use to drill pilot hole into the antler to accept screw to anchor onto base. 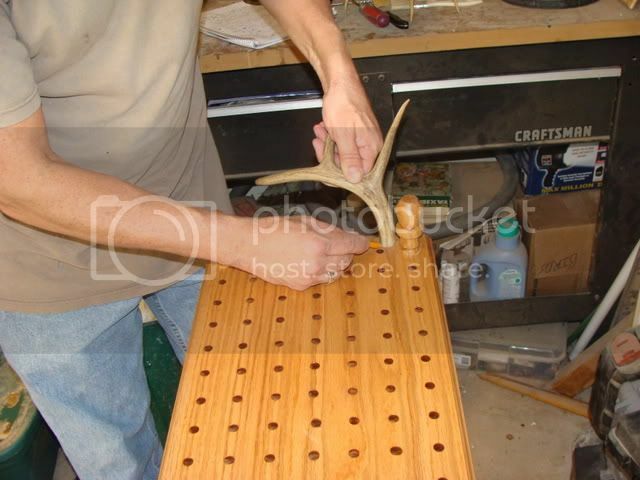 Now, with the antler held in place drill from the underside of the board into the antler. Drill out hole in board large enough to allow easy passage of screw then insert screw from under top board and screw into antler. The antlers serve as a great place to hang your gloves, armguards, tabs, quiver, etc. Hope that you found this tutorial helpful and wish you many happy days afield. 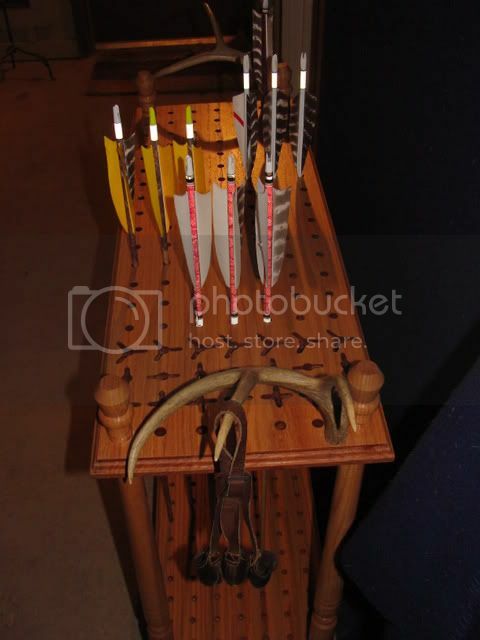 Thanks for sharing Wayne; that's an awesome looking arrow rack. Are you taking orders yet? Untested ideas are not facts. That is awesome and a pretty neet project. Thanks for the build-along!! The antlers are a very nice touch! Yep, I'm doing this project. Thanks! Nice addition to any man cave! Sweet! HH Big 5 Longbow 65#@28"
Bears paw T/D LB 75#@28"
The antlers are a very nice touch! Thanks! “Elk (add hogs to the list) are not hard to hit....they're just easy to miss"
Great job Wayne. As usual, very creative. Are you going to the banquet this year? The path of least resistance is what makes men and rivers crooked. Nicest arrow holder I've ever seen! Sweet! That's very nice work! 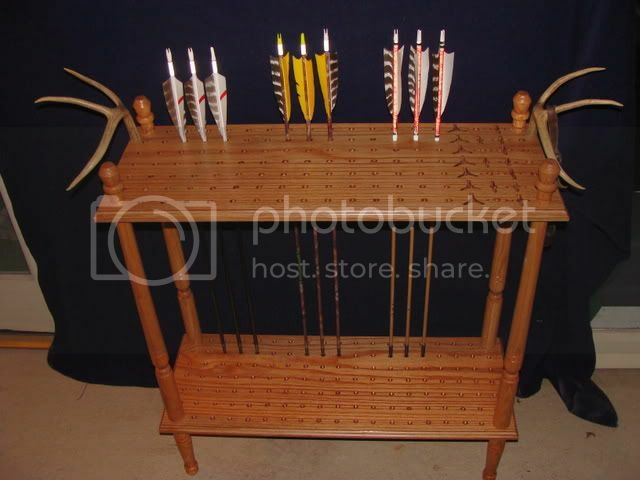 Billy, Yep going to the banquet, actually this arrow rack is a donation for the banquet auction. Thanks to everyone for the kind words, glad you enjoyed it, now go out and make ya one. Like Danny said, your wife might even let you keep this one in the house.